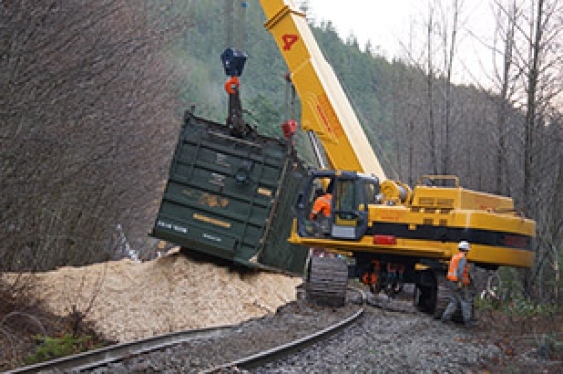 Between 2 and 4 Canadian National Railway cars derailed and flipped over December 21, 2014 outside of Squamish, British Columbia near the Culliton Creek Bridge at the end of Paradise Valley Road (Squamish Chief, pers. comm. nearby resident). The cars spilled their contents near a major curve in the tracks. No other details were provided by CN. For more information on many other CN derailments, see CN Railway Derailments, Other Accidents and Incidents. ~ by railroaded on December 23, 2014.